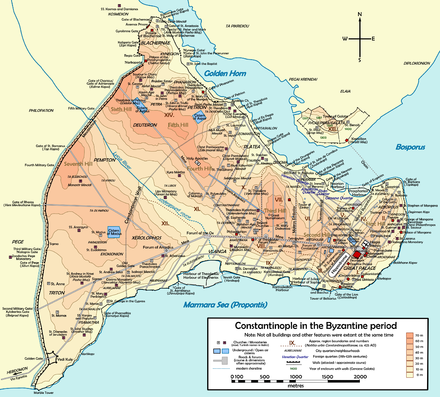 Constantinople (Eastern Orthodox), reversing the former. The contested councils mark the end of unity represented by the first seven Ecumenical Councils. Studies show that Photios was venerated as a saint as early as the 9th century, and by the Roman Church as late as the 12th century. Nonetheless, Photios was formally canonized by the Orthodox Church in 1847. Bardas and Michael engineered Ignatios's deposition and confinement on the charge of treason, thus leaving the patriarchal throne empty. 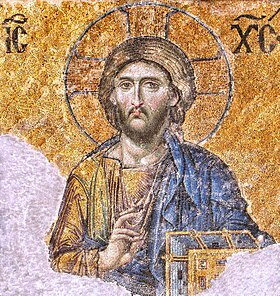 The throne was soon filled with a kinsman of Bardas, Photios himself, who was tonsured a monk on December 20, 858, and on the four following days was successively ordained lector, sub-deacon, deacon and priest, and then on Christmas Day, the patronal feast of Constantinople's cathedral, Hagia Sophia, Photius was consecrated as patriarch. Bardas and the empress Theodora." Nicholas Adontz stresses that "Arshavir, Photius' uncle, must not be confused with Arshavir, the brother of John the Grammarian". Constantinople et le Patriarcat Oecuménique. 3rd Vol. : Les Églises et les Monastères. Paris: Institut Français d'Etudes Byzantines. ^ Tougher 1997, p. 69 ^ Fortescue 2001, pp. 147–148; Louth 2007, p. 171; Tougher 1997, p. 69. ^ Chadwick 2003, Chapter 3: "Early Christian Diversity: The Quest for Coherence", p. 146. ^ Treadgold 1997, Chapter Fourteen: "External Gains, 842–912", p. 457. ^ Tougher 1997, pp. 70–71. ^ Treadgold 1997, p. 460. ^ Vlyssidou 1997, p. 33. ^ Treadgold 1997, p. 461. ^ Tougher 1997, pp. 73–76, 84. ^ Tougher 1997, pp. 85–86. ^ Tougher 1997, pp. 87–88. ^ Tougher 1997, p. 88. ^ Louth 2007, Chapter Seven: "Renaissance of Learning: East and West", p. 171. ^ Tougher 1997, p. 68. ^ Tatakes & Moutafakis 2003, p. 103. ^ Fortescue 2001, p. 138. ^ Jokisch 2007, pp. 365–386. ^ Jokisch 2007, pp. 365–386; Lemerle 1986, p. 40. ^ Lemerle 1986, pp. 26–27. ^ "The Lexicon of Photius" by Roger Pearse, January 15, 2011. ^ Paidas 2005, passim. ^ Photius (1983). On the Mystagogy of the Holy Spirit. Studion Publishers. ISBN 0-943670-00-4. ^ Photius; Joseph P. Farrell (1987). The Mystagogy of the Holy Spirit. Holy Cross Orthodox Press. ISBN 0-916586-88-X. ^ Lemerle 1971, p. 159; Plexidas 2007, "Introduction", p. 16. Nicholas Mystikos (907)". Byzantine Symmeikta (in Greek). 11: 23–36. This article incorporates text from a publication now in the public domain: Chisholm, Hugh, ed. (1911). "Photius". Encyclopædia Britannica. 21 (11th ed.). Cambridge University Press. Holy Spirit (English translation) Ongoing English Translation of the Lexicon Photii biblioteca ex recensione Immanuelis Bekkeri, Berolini typis et impensis Ge. Reimeri, 1824–25, vol. 1, vol. 2.